As time passed by, the hare grew immensely proud of her many friends. Having too many friends pleased the hare, for she counted happiness not by quality but by quantity. Also, read Hare And Tortoise Story. One day a terrible thing happened. There was a pack of hounds running in the forest and they were hunting hares. 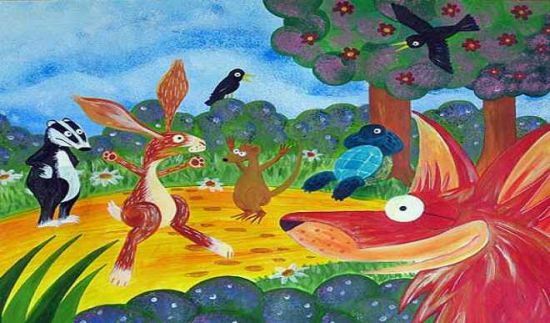 Scared, and desperate for help, the hare ran to her friends. She went to the horse first. “You are fast and have ample space on your back, please carry me to some safe place.” The horse, however, refused. “I have other important work,” was what he said. After this, the hare ran to the ram. “Will you help me?” she asked. “I would like to decline,” he replied. “You see, I do not like to interfere in other’s matters. And for your information, hounds have been known to eat sheep as well. So, ask for help some other day.” You may also like to read, The Hare’s Liver. Her last hope was the calf, who too refused. “I do not wish to take up too much responsibility. So, I can’t help you. By now the hounds were near. “What should I do?” Before she could think of something more, she ran. With all her might she ran! Luckily she escaped but she never made many friends again. She had learned her lesson. MORAL OF SHORT FABLES FOR CHILDREN: ONE WITH MANY FRIENDS HAS NO REAL FRIENDS.